Sub: NFIR's PNM item No. 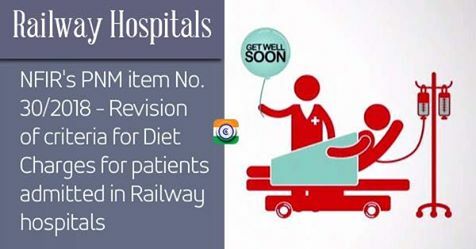 30/2018 - Revision of criteria for "Diet Charges" for patients admitted in Railway hospitals - regarding. Ref: This office letter of even number dated 29.10.2010. (ii) Basic pay/pension/family pension eligible for free diet in case of those suffering from TB or mental diseases - Rs. 69,700/-. (iii) No provision for concessional diet. (III) Monetary ceiling s. 69,700/- of basic pay/pension/family pension for the purpose of providing free diet to railway medical beneficiaries suffering from Tuberculosis (TB) or mental disease. This issues with the concurrence of Finance Directorate in the Ministry of Railways.